The first villain in the Batman Beyond universe was Derek Powers, who subjected to extreme radiation exposure, became Blight. Blight’s returned, and he’s pretty hot for Batman. Previously in Batman Beyond: Having been fished from the bottom of the Gotham Harbor, Derek Powers came under the care of Mr. French (not THAT Mr. French), who created a containment suit to keep the villain from sliding down the sewers as a big pile of radioactive sludge. Fully contained, and ready for action, Blight sets his sights on Wayne-Powers Industries, and Batman. This issue finds Terry and Blight in the middle of an all out fighty-fight sequence for the ages, with Terry on the receiving end of Blight’s radioactive grip. As one might expect in a story like this, all it takes is Terry using his brains to figure out a way to breach Blight’s containment suit, thus sending the villain off to return another day. While the fight scenes played well on the page, the breach of the suit was something readers saw coming a million miles away. It’s been done previously in the animated series, Batman has done it to Mr. Freeze in past issue of Detective Comics, so it comes off as anti-climatic when it plays out here. And while it appears Blight is gone, we all know he’ll be back… someday. The more interesting aspect of this three issue arc is the power struggle going on at Wayne-Powers Industries, where one Mr. G. Glen Godfrey is trying to blackmail and push Bruce Wayne’s buttons to get him to give up part or most of the control of the company. But Godfrey makes a big mistake in underestimating Wayne, who gives in to all the demands, and in the process secures control of the company, and in the process returns it to Wayne Incorporated. Yes, even in the future, the specter of Batman, Inc looms heavy in the pages. And while this turn puts Wayne Incorporated back into the spotlight, it’s the conversation between Wayne and Godfrey that peeks my interest. Could we be seeing the return of the New Gods and Darkseid? It would be interesting to see what Beechen does with those characters in a future setting. As I mentioned above, there is a lot of predictable plot elements in this story, but it is still interesting enough to lead me through the issue. The Godfrey moment, and the subplot with Max are probably the most interesting elements of the issue. Ryan Benjamin’s style has improved greatly since this series kicked off a year ago. His staging and layout of the action on the page works really well, especially during the big fight scene moments. But even with these improvements, I still feel there are many inconsistencies when it comes to his ability to render faces. You can tell who is who, sure, but the shape of the face, and the subtle bits like eyes tend to change from panel to panel. The other art element that is different in this issue is the coloring. Usually we see all the action taking place against the dark hues of Gotham at night, but this go around, we get to see it take place during the daylight. This allows many different color combinations to be used, and in the end the action pops off the page more. 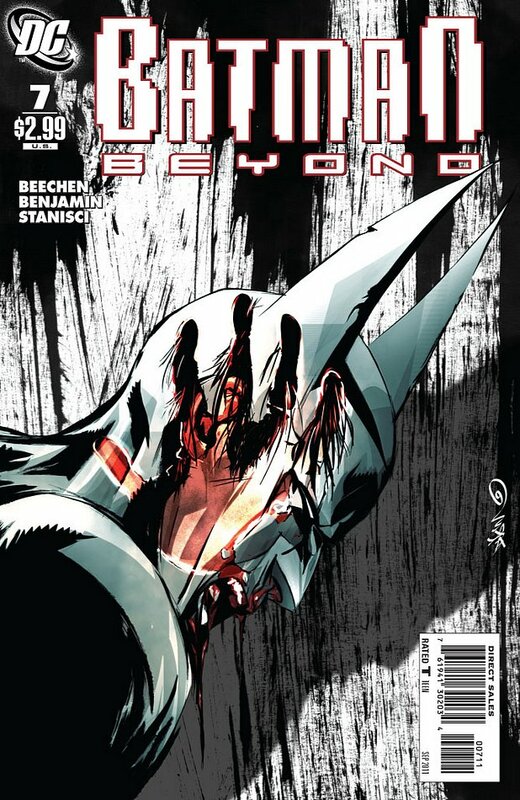 It’s been an interesting run for Batman Beyond this go around. There’s been a lot more universe building and expansion on characters that we didn’t get before, and with Superman Beyond and JLA Beyond on the way, it looks like Terry and Bruce are set for the long run. Even though it has a number of predictable moments, this issue contains a few important moments and is worth checking out. 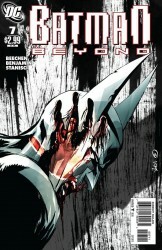 Batman Beyond #7 is good enough to earn 3.5 out of 5 Stars. *IS* this going to continue in the DCnU? I heard this and Sup-Beyond were it? The online versions are short because they are released more often and for that .99 price point, and those will be “collected” into a single print edition down the road. 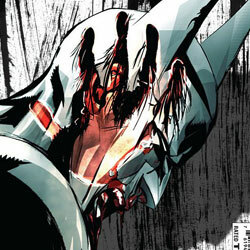 That being said, Batman Beyond #7 is not the short digital-first release. Sorry for the thread necromancy. I thought this was on the new series that I found on Comixology. They are cheap but only like 12 pages long.